The Interstate Lightweight Four Championship was introduced in 1958 after a long history of lightweight rowing within Australia. The original weight restriction was for athletes who weighed no more than 140 lbs (63.6 kg). The weight limits have changed over time but since 1974 have mirrored those of FISA namely 72.5 kg maximum and 70 kg crew average. 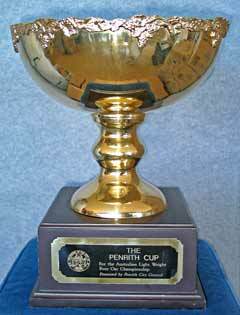 The Penrith Cup was presented to the Australian Amateur Rowing Council in 1958 by the Penrith City Council as the perpetual trophy for the event. The event was the pinnacle of a lightweight oarsman’s career until 1974 when the first FISA Championships were conducted. The strength and depth of Australian lightweights was shown by a gold medal at the 1974 FISA Championships in the fours and the considerable success achieved by Australian lightweights ever since that time. The quality of winning crews of the Penrith Cup is consistently very high. This summary shows the results of the final and where known, the other crews in order of finishing in the repechage. NB: Dead heat in 2002. The race has been conducted on only 59 occasions.